The “May Ladies” is one of the sweetest retreats we offer here at Dragonfly. The leaves are just beginning to unfurl, the azaleas are about to pop, and the birds alight in the trees, building nests for their first broods. Everything about the land here in early May is lush and ready to burst into every shade of green; and the mountain… oh, is she pretty in the springtime, rising violet blue into the sky! Spring Into Your Authentic Self! May 30th ~ June 2nd, 2019 – our 8th Annual!! See the Squam Yoga page for registration! Retreat Cancellation Policy for Group Leaders: For the business/leader organizing the retreat: should the presenter cancel the retreat 120 or more days in advance, 100% refund of participant registration will be issued, minus $500 non-refundable deposit. Should the presenter cancel the retreat 119-90 days in advance, 50% of participant registration will be issued, minus $500 deposit. Cancellations made less than 90 days in advance will result in no refund to presenter / business. In the event that a refund is required, Dragonfly Yoga will reimburse the presenter / business within 30 days of cancellation. Individuals: Once you register for a Dragonfly Retreat, your deposit (half of your retreat fee for weekend retreats, and full booking deposit on international retreats) is non-refundable and non-transferable (unless you have permission of the retreat leader to transfer your spot to another guest, and Dragonfly receives a transfer registration form and any necessary fees) . While we realize “life happens,” our policies are FIRM, as we only have so many group retreats available, and only so many spots to offer in each retreat. Should a prospective guest need to cancel 60 days or more in advance of retreat start (90 days for international retreats), there is a 50% refund, minus deposit. Should a registrant need to cancel 30-59 days in advance, there is a 25% refund, minus deposit (inside 90 days, there is no refund on international retreats). Inside 30 days, there are no refunds. Retreats fill quickly, so please choose your special weekend wisely and joyfully! Spent yesterday afternoon (3/24/18) at Girish workshop/yoga class. I had a great time. The property is beautiful and Katie was awesome! One of the best yoga experiences I have had. Make the time to experience Dragonfly yoga. Your center looks lovely. I am inquiring to see if you have interest in hosting a Yoga Nidra teacher training for 2020. Dr Halpern and myself would teach. 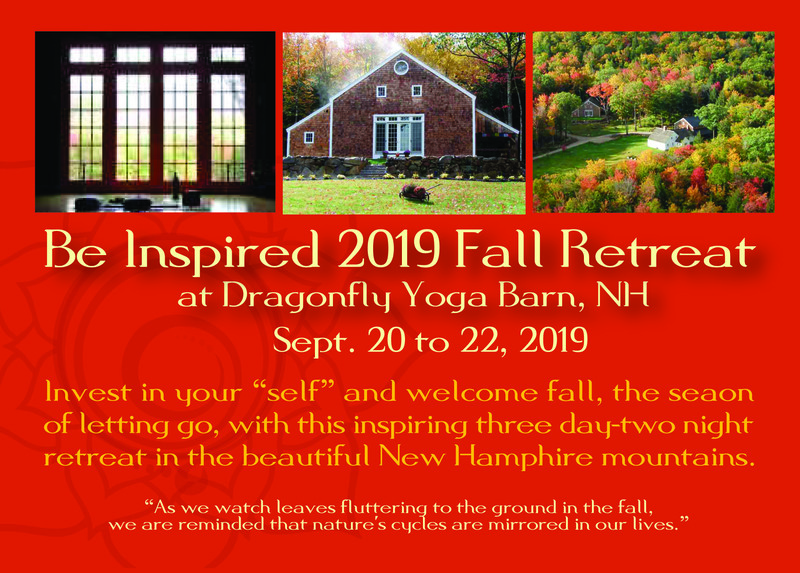 There is something truly magical about practicing yoga in a beautifully restored 300 year old barn surrounded by the White Mountains, with Katie O’Connell as your guide. She is warm and caring and works with your own abilities. And the food is to die for!